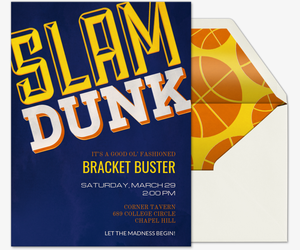 Get ready for the madness…This March, plan a slam-dunk college basketball viewing party with the help of digital invitations from Evite. Whether you plan to sit courtside or watch from your living room couch, gather fellow fans to cheer on your favorite team. 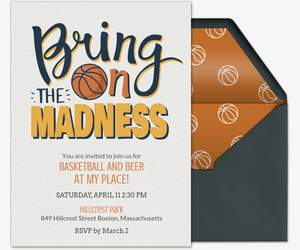 Choose from our gallery of insane basketball party invitations for tailgates, game viewing parties and fitness challenges with your friends. Once you’ve drafted the winning invitation, provide all the details in a custom host message. Got spirit? Tell your guests to come dressed in jerseys (bonus points for foam fingers). Season just starting? Provide a link to a printable tournament bracket and tell everyone to come prepared with their winner predictions filled-in! Or, duplicate your invitation to send again based on the TV schedule, from the Round of 64 all the way to the championship game. Score every time with a free digital invitation from Evite. Choose our “Bring on the Madness” design to get fans amped up or, if you’re warming up for the championship game, choose a design themed around the finals. For a little pre-game fun, host a tailgating party with our free “Beer and Brats” invitation. Looking for a little extra rah-rah? 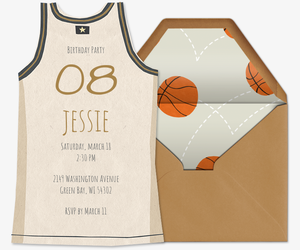 Represent your team by customizing our free upload-your-own invitation templates with your own choice of images, or choose one of our free “College Hoops” invitations in your team’s colors. Or, take inspiration from the team and invite friends to join you for a fitness challenge. 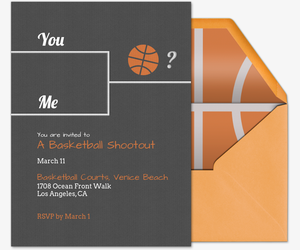 Send out our free “Get Your Shoes On” invitation or our free megaphone-inspired “Fitness Madness” invitation. Get stretching! Tournament heating up? The finals deserve a Premium Evite invitation. Our Premium invitations come with matching envelopes, custom digital “stamps,” and the option to add inserts like photo or text cards. Our ad-free Premium invitations can be purchased for less than the cost of a postage stamp -- send up to 1$12.99 for 15 guests, $24.99 for 50 guests and $49.99 for up to 750 guests. Stocking up on stacks of snacks? 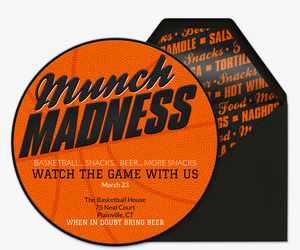 Choose our Premium “Munch Madness” invitation. 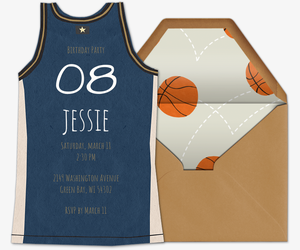 Or show your spirit by choosing one of our jersey-themed invitations in your team color. Want to challenge someone to a game of your own? 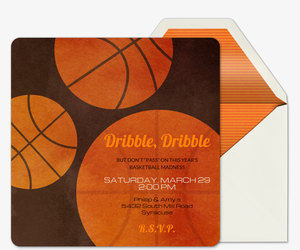 Tell them to meet you on the court to shoot hoops with our Premium “One on One Baby” invitation. And remember, you can also make your own invitation by uploading a photo or design onto one of our upload-your-own or design-your-own invitation templates. March toward game day with hosting tips from our party champions at Evite party ideas. The tournament might be chaotic frenzy and absolute craziness, but your game viewing party doesn’t have to be. Check out our Sports & Leagues page for fuss-free party ideas whether you’re watching the game on TV or celebrating a solid season with your own sports team. Step up your MVP game with our March frenzy game-time eats, featuring foods that will make any guest dribble, from nacho average chilli cheese skillet nachos to sweet and salty chocolate-dipped chips. Or, check out our tailgating party kit to make sure you’ve packed everything you need for a winning tailgate. The ball is in your court -- start working on your game plan now!